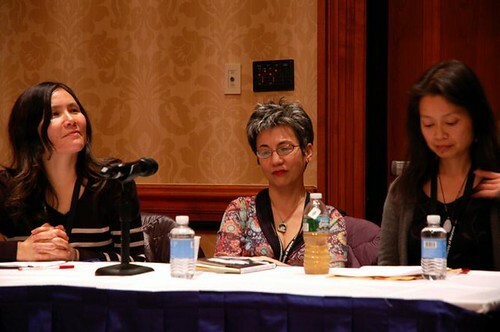 Neil Aitken, Jennifer Chang, and Sarah Gambito, who comprised one half of the Kundiman Panel. 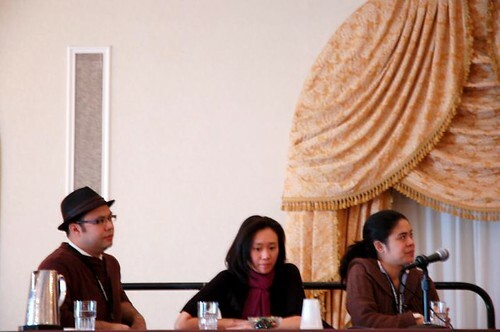 This year, we were struck once again with the generosity and warmth of those in the Asian American poetry community—from Neil Aitken of Boxcar, who allowed us to use almost half of his bookfair table for our materials; to Kaya Press, who made content recommendations and gave us review copies; to Kundiman and the AAWW, who offered us time to introduce ourselves and a shoutout, respectively, at their panels; to all of the many people who came up to us to introduce themselves, to inquire about what we do, or to give us a kind word of encouragement. It was both gratifying and amazingly thrilling to get to finally meet some of our contributors at our off-site reading, and on the whole, we were struck once again with how humbling and exciting it is to have the chance to do what we do, within the context of the community into which we’ve been carving our niche. This year, though, was also different for us—in that we came to the conference with a little more experience under our belts, and hot on the heels of the questions that we wrestled with in the editors’ note of our second issue. And this year, it seemed that everywhere we went at the conference, those same questions—about definitions and identitarian politics—continued to follow us, throwing out new challenges to consider and further questions to contemplate at every step. From the first event we attended (a panel about Catholic identity at which we heard Luisa A. Igloria reflect on the relationship between Church and Philippine history, and how the tension of that balance manifests itself in her writing), to the last (the AAWW’s anniversary reading, at which we heard and were encouraged by well-established Asian American writers who explored subjects that often ranged far and beyond those that have come to be familiar within the Asian American literary canon), we continued to be confronted and struck by the way that contemporary Asian American literature regularly defies and transgresses its own boundaries, manifesting itself in areas where one might not otherwise think it a relevant, and incorporating work, and writers, who might not otherwise fit the categorically ‘orthodox’ definitions that we, or others, have tended to set for it. Luisa A. Igloria speaks at Thursday's 'The Rosary Effect' panel. 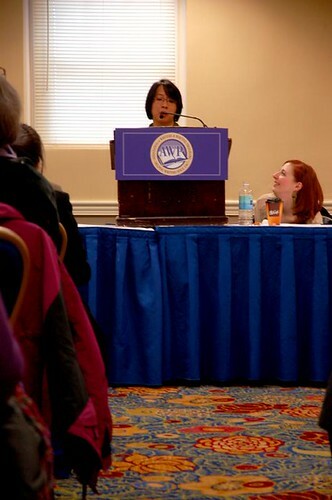 The Asian American Writers’ Workshop was at AWP for the first time this year, and we were particularly struck by something that Ken Chen, its director, said at their Friday “Page Turners” panel. The AAWW, he said, has occasionally been criticized for getting involved with programming that does not seem to be directly, distinctly, related to Asian American identity (for example, sending people to participate in protests against the recent immigration legislation in Arizona). But such criticisms, Ken feels, are unfounded; he sees the mission of the AAWW (to curate literary events and to build coalitions) as one which absolutely necessitates a broad, rather than a narrow, focus. The act of curating, he said, can be used “like a flashlight on the surface of history,” to contextualize Asian American writers and their work by putting it in conversation, and in context with, broader political issues that apply to people from different eras, and of multiple ethnicities. An important part of the work that they do at the Workshop thus consists of “curating” people of different ethnicities together around issues of politics and art, in the belief that politics is not something that should be separate from individual identity or expression. Participating in broader political explorations, he said, allows the AAWW’s work to remain relevant. Such a position, though, requires that the Workshop envision Asian American identity (and, by association, Asian American literature), as something which is dynamic, rather than fixed. This view infuses everything that the AAWW does, from the readings and discussions it holds to its newest project—Open City—which sets out to track gentrification throughout New York City, without claiming to limit its focus to Asian American communities exclusively. [We are, by the way, very intrigued by the work being done on the Open City blog, and hope to write an Editors’ Picks post about it at some point, but that is a subject for another occasion]. Ken’s words resonated deeply with us. 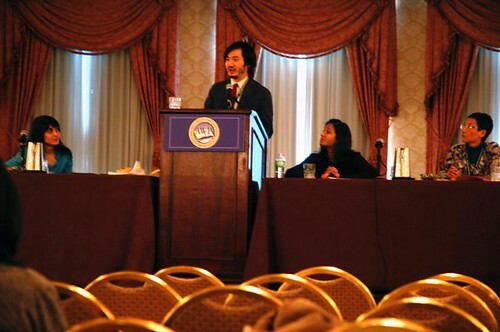 From an editorial perspective, we often consider how to hold our ‘Asian American’ designation loosely while still remaining true to our mission of being a space where both poetry by Asian American poets and poetry that engages with questions relevant to the study of the Asian diaspora can be played out. And we liked Ken’s idea of the literary curator as both a “critic and an anthropologist” of literature. His comments provided a bit of an ideological lens for us as we continued on through the rest of the conference, and caused us to ask how we might push ourselves further in this respect. 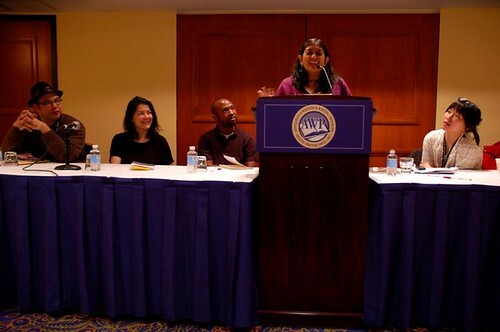 Purvi Shah speaking at the Asian American First (Poetry) Books Panel. The notion of the “paper bag test” came up several times, albeit in jest, during the panels that we attended that weekend. (For those unfamiliar with the term, it refers to an old practice of determining how white a person of mixed heritage was, based on how closely the shade of their skin correlated with the color of a paper bag, but nowadays is used more broadly in conjunction with questions that have to do with what proportion of a person’s bloodline should derive from a certain ethnic heritage in order for their work to be “counted” as Asian American, as African American, as Latino American, etc., or to be considered by curators of literature and art whose work focuses on those particular racial designations). To be honest, we find the idea of engaging closely with such minute genealogical disputes deeply uncomfortable. The race question is one that we often get asked—”How ‘Asian’ do I have to be to submit work?” or “Will you look at my work even if I’m not Asian?” (For the record, our answers are: “It doesn’t matter,” and “Yes, of course,” respectively). And while the history of how race and identity have been marked in America is indeed extremely relevant to what we do, the last thing we would like the content of our magazine to be is a sort of ‘litmus test’ against which the ‘Asian Americanness’ of a poet can be judged. So we return to that nagging question once more: what, then, should an Asian American literary journal publish? Certainly, we should, and desire to, publish work by poets who identify as Asian American—but we hope to do far more than only that. None of us write, or exist, in a vacuum. So why shouldn’t we be a publication that challenges established definitions about whose work, and what kind of poetry, may be considered relevant to this construct that we embrace and call ‘Asian America’? A space that allows Asian American poets to read their work in a context that, even while celebrating it, refuses to isolate it from the greater conversation? A magazine that invites both Asian Americans and non-Asian Americans to read, and to find something compelling and relevant, within the work that we’ve curated together under the category of ‘Asian American poetry’? Why should we not allow ourselves to engage with flux, with disorder, with the complex irreconcilibilities of hybrid identity (‘Asian American’ is, after all, a hybrid designation, as it clumps people of many experiences and ethnic identities together into the same category, and becomes even more complex if we are to define ‘American’ broadly, too, in recognizing that the implications of ‘America’ extend far beyond the 50 US states, and that ‘Asian Americanness’ is, in a way, an inherently transnational condition—such that we already receive, and publish, work by poets who are not based in the US)? Douglas Kearney blows the audience away with his deliciously bone-rattling performance at the 'New Kind of Hybrid' panel. Punny as it may sound (given the presence of the light source in our own name) we left the conference thinking hard about how to actively embrace Ken Chen’s metaphor of curation as a flashlight. How might that look, practically? We’re not sure yet. The Postcard Poetry Project (which invites writers of any sort—poet and non-poet, Asian and non-Asian—to read and respond to Asian American poetry), might be one place to start. And we’d like to continue to push forward the ideal of exploring critical, aesthetic, and political questions, rather than familiar tropes, in our future issues. Whatever the case, Ken’s thoughts have given us something meaty to chew on for the future. 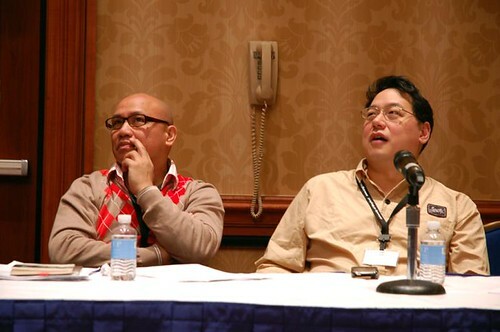 “We [the Asian American Writers Workshop] are always reinventing Asian American literature,” he said at one point. It seems to us that in order for LR to remain contemporary and relevant, we need to be able to do the same. 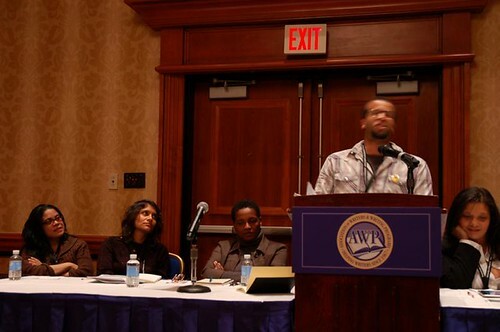 To see the rest of our photos from the AWP Panels we attended this year, visit our Flickr set.